Ever think that there could be a better way? I know I'm preaching to the choir, since if you're here, you're probably already on the path to a better way, a lean transformation! Yet it always amazes me at how much waste is clearly visible around most production floors (and non-production areas!!). People do their work a certain way for so long, they don't realize that there could be an easier way to do things. They continue to live with chaos and stress in their lives, without investing the energy to make their own jobs easier. "We planned and re-planned work. It was chaos. We thought that was how it had to be!" Sound familiar to anyone? Too familiar. Check out the video. There's some pretty cool hand sketching going on. And a nice description of batch vs lean production. If you can't see the video below, click here to view it on youtube. The video was really great. 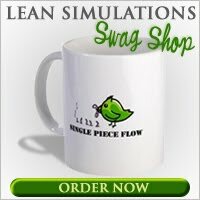 Details on how to create a Lean factory are available in this video. Thanks for sharing this video and beautiful article with us. I am a writer and i delivered some good quality writing services for my students for their academic help. I want to help you to get the valuable writing services from my essayvikings.com review site. You will benefited from my services. Thanks for being with us. Thank you for sharing! It's very interesting.